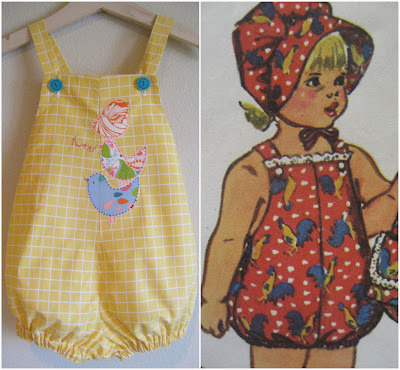 hart + sew | Vintage Baby Clothing: announcing... giveaways! I've decided to liven things up around here by starting a monthly giveaway! Now that my shop is open and all the start-up preparation is over and done with (phew!) I am feeling good and want to celebrate! The giveaways could be anything - you'll just have to be surprised! To begin with I wanted to start things off by making something especially for one of you! This month I am giving away a size 12-24 months bubble jumper! Below is an example of a bubble jumper I have made (this one is for sale in the shop). The winner can help me choose the color/style! Even if you don't have kids, it would make a great present or baby shower gift. Just leave a comment to enter, and if you want to pass the word along feel free! I'll announce the winner next Wednesday! So cute! I just found your site via Melissa Esplin's blog. Love your style! YAY! I love that you are totally embracing your business. AAAHhhh! I'm in love with all of your adorable clothes!! I'd love to win! I just might need this someday!! (Linked over from Vanessa) - love your style. I love these things! I have been trying to figure out where to get one, so here's hoping this is where. This is too cute. I would love to win this and store it away for when I have a baby! Don't enter me to win...I want to give everyone else a better chance of winning, and since Avery already gets one of your cute rompers its really not fair to deprive someone else. I just wanted to say how impressed I am with all of your creations. seriously adorable! Found you through mysparkle. That is darling! I found you from Danielle. i linked over from danielle... these are all so cute! So cute! I would love to win it for my best friend's adorable 14-month-old.